Vajra (Devanagari: वज्र; Chinese: 金剛 jīngāng; Korean: 금강저 geumgangjeo; Tibetan: རྡོ་རྗེ། dorje; Japanese: 金剛杵 kongōsho) is a Sanskrit word meaning both thunderbolt and diamond. it is also a common male name in Tibet and Bhutan. Additionally it is a symbolic ritual object that symbolizes both the properties of a diamond (indestructibility) and a thunderbolt (irresistible force). The vajra is used symbolically by the Dharma traditions of Buddhism, Jainism and Hinduism, often to represent firmness of spirit and spiritual power. 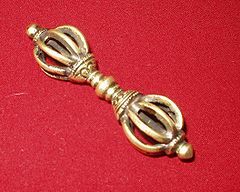 The use of the vajra as a symbolic and ritual tool spread from India along with Indian religion and culture to other parts of East and Southeast Asia. The earliest mention of the Vajra is in the Rigveda, a part of four Vedas. It is described as the weapon of Indra, the god of heaven and the chief deity of the Rigvedic pantheon. Indra is described as using the Vajra to kill sinners and ignorant persons. The Rigveda states that the weapon was made for Indra by Tvastar, the maker of divine instruments. The associated story describes Indra using the Vajra, which he held in his hand, to slay the Asura Vritra, who took the form of a serpent. On account of his skill in wielding the Vajra, some epithets used for Indra in the Rigveda were Vajrabhrit (bearing the bolt), Vajrivat or Vajrin (armed with the bolt), Vajradaksina (holding the bolt in his right hand), and Vajrabahu or Vajrahasta (holding the Vajra in his hand). The association of the Vajra with Indra was continued with some modifications in the later Puranic literature, and in Buddhist works.Buddhaghosa, a major figure of Theravada Buddhism in the 5th century, identified the Bodhisattva Vajrapani with Indra. 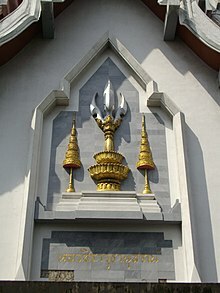 Indra’s Vajra as the privy seal of KingRama VI of Thailand. Another version of the story exists where Dadhichi was asked to safeguard the weapons of the devas as they were unable to match the arcane arts being employed by the asuras to obtain them. Dadhichi is said to have kept at the task for a very long time and finally tiring of the job, he is said to have dissolved the weapons in sacred water which he drank.) The devas returned a long time later and asked him to return their weapons so that they might defeat the asuras, headed by Vritra, once in for all. Dadhichi however told them of what he had done and informed them that their weapons were now a part of his bones. However, Dadhichi, realising that his bones were the only way by which the devas could defeat the asuras willingly gave his life in a pit of mystical flames he summoned with the power of his austerities. Brahma is then said to have fashioned a large number of weapons from Dadhichi’s bones, including the Vajrayudha, which was fashioned from his spine. The devas are then said to have defeated the asuras using the weapons thus created. There have also been instances where the war god Skanda (Murugan) is described as holding a Vajra. Skanda is also the name of a Bodhisattva in Mahayana Buddhism who wields a Vajra. In Buddhism the vajra is the symbol of Vajrayana, one of the three major branches of Buddhism. Vajrayana is translated as “Thunderbolt Way” or “Diamond Way” and can imply the thunderbolt experience of Buddhist enlightenment or bodhi. It also implies indestructibility, just as diamonds are harder than other gemstones. In the tantric traditions of Buddhism, the vajra is a symbol for the nature of reality, or sunyata, indicating endless creativity, potency, and skillful activity. The term is employed extensively in tantric literature: the term for the spiritual teacher is the vajracarya; instead of bodhisattva, we have vajrasattva, and so on. The practice of prefixing terms, names, places, and so on by vajra represents the conscious attempt to recognize the transcendental aspect of all phenomena; it became part of the process of “sacramentalizing” the activities of the spiritual practitioner and encouraged him to engage all his psychophysical energies in the spiritual life. An instrument symbolizing vajra is also extensively used in the rituals of the tantra. It consists of a spherical central section, with two symmetrical sets of five prongs, which arc out from lotus blooms on either side of the sphere and come to a point at two points equidistant from the centre, thus giving it the appearance of a “diamond sceptre”, which is how the term is sometimes translated. Various figures in Tantric iconography are represented holding or wielding the vajra. Three of the most famous of these are Vajrasattva, Vajrapani, andPadmasambhava. Vajrasattva (lit. vajra-being) holds the vajra, in his right hand, to his heart. The figure of the Wrathful Vajrapani (lit. vajra in the hand) brandishes the vajra, in his right hand, above his head. Padmasambhava holds the vajra above his right knee in his right hand. The vajra is made up of several parts. In the center is a sphere which represents Sunyata, the primordial nature of the universe, the underlying unity of all things. Emerging from the sphere are two eight petaled lotus flowers. One represents the phenomenal world (or in Buddhist terms Samsara), the other represents the noumenal world (or Nirvana). This is one of the fundamental dichotomies which are perceived by the unenlightened. The physical manifestation of the vajra, also called dorje in this context, is the male organ. Arranged equally around the mouth of the lotus are two, four, or eight creatures which are called makaras. These are mythological half-fish, half-crocodile creaturesmade up of two or more animals, often representing the union of opposites, (or a harmonisation of qualities that transcend our usual experience). From the mouths of the makaras come tongues which come together in a point. ^ a b “Story of Sage Dadhichi and the Vajrayudha”. Retrieved 2009-09-20. ^ a b “The Great Sage Dadhichi”. Retrieved 2009-09-20. ^ a b “Dadhichi Rishi”. Retrieved 2009-09-20. This page was last modified on 2 May 2013 at 10:46. What is the purpose of Odzer Chenma practice ? Maritse or Odzer Chenma: She who emanates rays of light and protection. 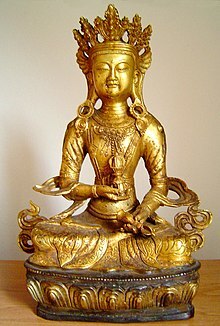 She is a particular manifestation of Tara, associated with the light ofthe sun. Sometimes her practice is performed before a long journey, for example. Shitro is a practice of compassion, often for someone ill or dying. Chod is a practice for ‘cutting away’ at the ego through visualisations, and the last one is a practice of a form of Avalokiteshvara. I was able to determine what lungs ChNN gave on last webcast. if you got initiated guru yoga that is to say that I have received the introduction to the Nature of Mind? How to arrange all of these practices? Dedication of merit at the end. Dedicating the merit, I have to sing the mantra that I can only recite it? I don’t know. I didn’t watch the last retreat. Best to ask on the Dzogchen Community thread in Dharma Wheel. Guruyoga is usually part of the first couple of days transmission. That is when you receive Direct Introduction, which you can only do ‘live’ – after that’ your experience is yours alone as you try to be in the natural state for longer periods. If you download the Thun and Ganapuja book, the practices are in there. The deity practices are in the ‘Mantras and Invocations’ book. For melodies there are mp3 files etc. If you join the Dzogchen Community then you can have access to all the webcasts and replays of previous webcasts. The Admin tells me you didn’t apply properly, so try again with your real name. The Song of the Vajra has a specific melody, which it is best to use, but both that and the Dedication can be chanted without a melody. It shows they are wrathful – to deal with obstructions, harmful spirits etc. which the practitioner may encounter. Join Dharma Wheel forum and ask such questions there, please: http://www.dharmawheel.net.